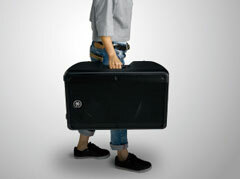 The DBR Series is the follow-up to the acclaimed DSR and DXR Series and the most portable powered speaker that Yamaha offers. Comprised of three new models, the DBR10, DBR12 and DBR15, the new lineup features the state-of-the-art DSP technology inherited from its predecessors, ensuring superior performance and versatility, and safe, consistent operation. Yamaha’s innovative FIR-X tuning utilizes linear phase FIR filters for the crossover, achieving more accurate and smooth response for outstanding clarity and imaging, while D-CONTOUR dynamic multi-band processing applies optimized settings for either front-of-house or floor monitoring applications. 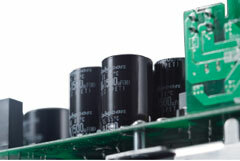 The DBR also employs many of the same protection functions used in our top-class TXn Series professional power amplifiers, assuring reliable operation for extended durations of usage. 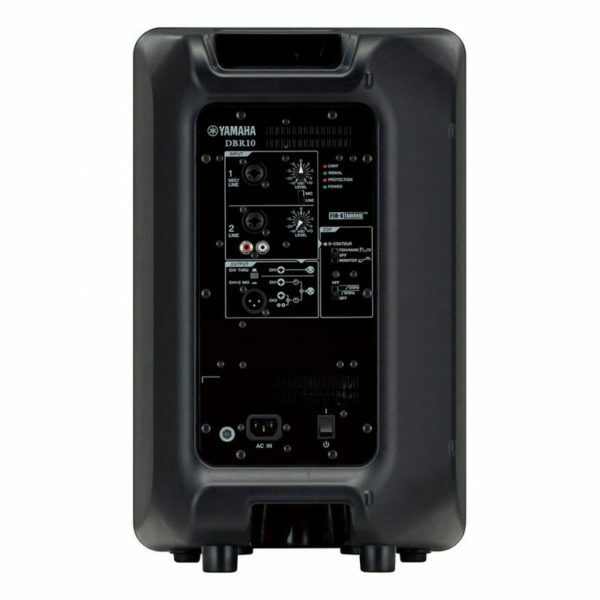 The DBR’s Class-D amplifiers deliver up to 1000W of power, achieving an impressive maximum SPL of up to 132 dB with consistent sound quality and performance. The transducers were carefully selected and then thoroughly customized to perfectly match the amplifier’s properties in order to deliver high output power with minimal distortion. 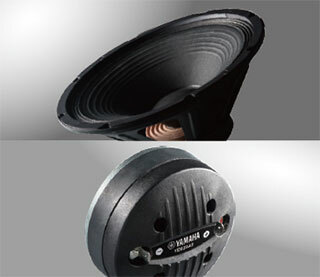 The new lineup also features Yamaha’s extremely accurate wide dispersion constant-directivity horn that evenly projects the DBR’s deep bass, clear midrange and accurate high frequencies to the outer-most edges of a very wide coverage area. 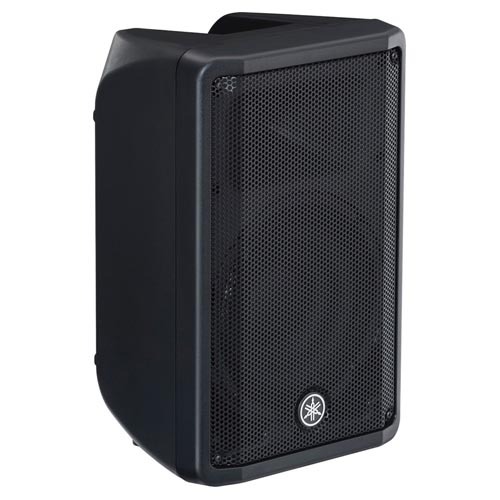 Portability and versatility factored heavily into the DBR Series’ design favouring a rugged,　compact and light-weight plastic enclosure, fitted with a sleek steel grille and ergonomic handles allowing for fast, safe and easy transportation and setup. The DBR also features an optimized 50°　wedge angle for floor monitoring use, while the symmetrical cabinet shape of the DBR12 and DBR15 allows them to be placed in a “mirror-mode” configuration. 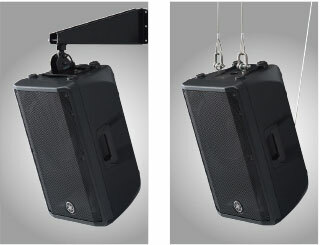 All models come equipped with rigging points compatible with optional speaker brackets and eyebolts for installed applications. 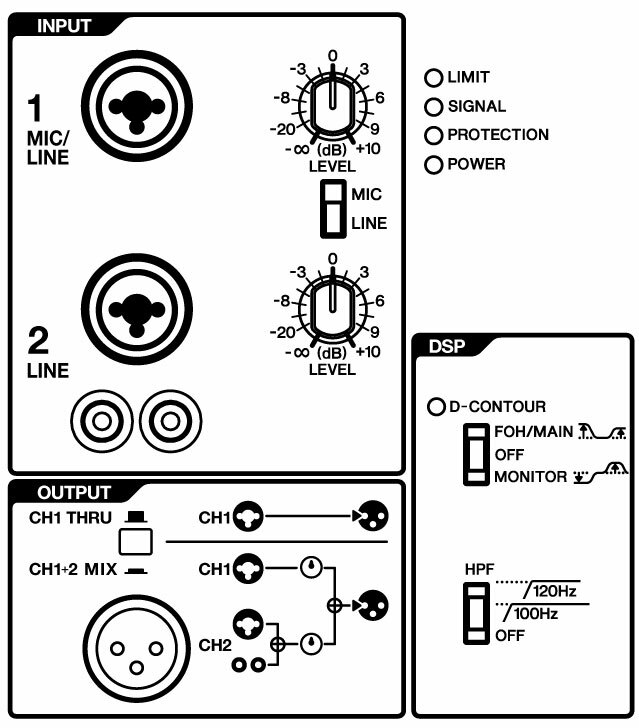 Each DBR model also features an easy-to-use 2-channel onboard mixer. 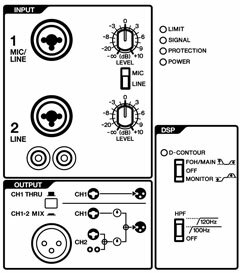 CH1 has a combo jack that accepts both XLR and TRS Phone, allowing for either Mic or Line level inputs. CH2 also features a combo jack, as well as an RCA pin jack for input from CD players or stereo line-level sources. The mixer allows you to select either CH1+2 MIX, or CH1 THRU to pass the signal from CH1 only. The DBR’s lightweight, high performance Class-D amplifier is capable of producing up to 1000W* of power, achieving an SPL of 132dB, delivered with remarkable clarity and dynamic characteristics. 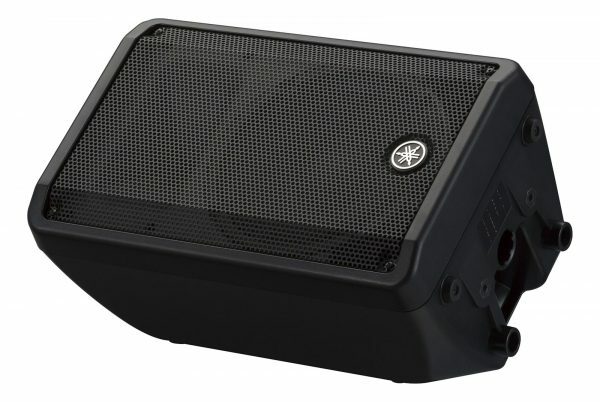 The high power output woofers deliver well-defined, powerful bass with minimal distortion, while the 1.4″ precision compression driver* produces accurate mid-range and high frequencies. *DBR10 features a 1″ compression driver. DBR Series speakers feature an optimized 50°wedge angle for floor monitoring. In addition the DBR12 and DBR15’s symmetrical shape allows for effortless configuration of a mirror-mode floor monitoring system in either symmetrical or stereo sound field setups.